At first I thought it was related to flash : http://www.mydigitallife.info/mouse-pointer-flickers-blinks-or-disappears-in-web-browser-ie-firefox-google-chrome/, but this was not the case. 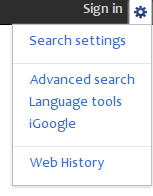 Another workaround can be : bookmark http://www.google.com/webhp?complete=0 for searching, or set it as your browser home page. Yes, Thank you, worked for me too.